Please join Richard Gage, AIA, of AE911Truth on our thirteen-city tour through the great Pacific Northwest. We will be screening our latest film, Firefighters, Architects & Engineers: Expose 9/11 Myths, and we’ll be presenting our landmark Beyond Misinformation booklet. 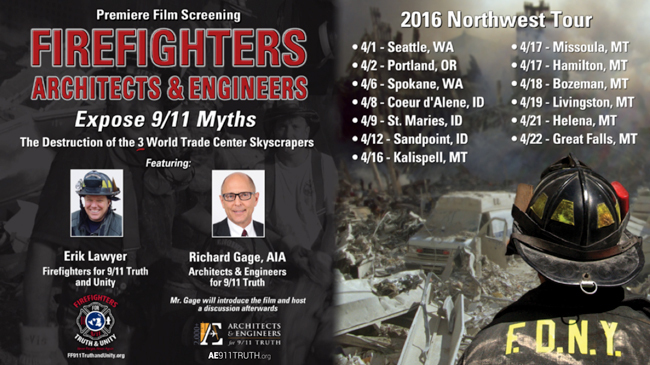 The 90-minute Firefighters, Architects & Engineers: Expose 9/11 Myths (FAE) features a landmark joint presentation by Erik Lawyer, the founder of Firefighters for Truth & Unity, and Gage. Together they dismantle two-dozen myths that comprise the official account of the destruction of the three World Trade Center skyscrapers on 9/11. Watch the film trailer. Beyond Misinformation: What Science Says About the Destruction of World Trade Center Buildings 1, 2, and 7 will be presented and available for purchase at the event. It is AE911Truth’s new 50-page comprehensive guide to the explosive evidence at the World Trade Center. Some 50,000 copies have been distributed since its release in September 2015. We look forward to seeing you on our tour! Get more information at our Facebook Event Page. Coordinate a radio or TV interview for Richard Gage by emailing Samantha Penn at SPenn@ae911truth.org.